If you are looking for a traditional method for piping foods, this Ateco 3216 decorating bag is the product for you! This 16" canvas bag is great for piping drop cookies, mashed potatoes, or even thick dough. Due to its canvas construction, this bag will withstand heat and is designed for heavy-duty use, although it is not recommended for use with fatty or greasy products. Whether you're decorating at a commercial bakery or for a catered event, this pastry bag is a reusable option to help you lessen your environmental impact. As simple as this item may seem it is a great help in a busy kitchen. Our chef loves to use this item for piping on sweets and savories. From desserts to twice baked potato. Great item for the money. I enjoy piping with the canvas bag for the feel of it in your hands. Less slippery than the plastic ones so you are able to get a good grip when using. I've tried to send the disposable bags on site and the kitchen directors complained , these work perfectly and use several tips it's a good wash and use over and over . Very sturdy. I use the Ateco Canvas pastry bag when I need to pipe hot items. It works great. I've used it to fill manicotti and to pipe profiterole dough to be baked. Works great! I love this pasty bag, i bought it in 2016 still looks new. its washable i use it for icing cakes. best part is i just rinse it and throw it in the wash. the price cant be beat. I really like these bags. I use the disposable bags when working off-site, but for everyday use in my bakery kitchen I prefer not to add to landfills :) These are easy to clean-- really just rinse and then wash in some warm soapy water and air dry. The only downside is that the tip is pre-cut and looks to be hemmed, so you can only use them with specific size couplers-- that's the reason for the 4-star instead of 5. This bag is a great size and holds a good amount of filling. The only reason i didn't give it 5 stars is because it doesn't have a coating inside the bag to prevent staining and product from getting into the fibers of the canvas. 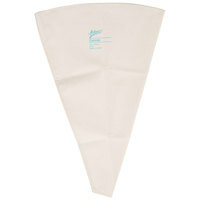 We use this 16" pastry bag when there are a lot of cupcakes to frost! We primarily use cream cheese frosting & it works great with it. Love this piping bag! Perfect for filling Cannoli and love that it is washable/reusable. Highly recommend and I plan to buy several more for myself. Very sturdy and can hold quite a lot of filling/icing. Nice size. If using it for butter - the oils from the butter seeps through and gets quite messy. Should only be used for frosting or non-oily items. Still, very pleased with quality. These are okay. They work and they're so durable so they'll definitely be long lasting, but I hate cleaning them. I prefer the disposable plastic ones, but if you don't mind cleaning them, these are great too. I absolutely love this product! This canvas pastry bag works great! This bag is 16" so it holds a decent amount of icing! Great quality! This is a great everyday user. I have zero complaints about this bag! It is my right hand man, well it and plastic wrap!! It's a must have in my book! Aside from the discoloration that is to be expected with over a year of heavy use, we have used this bag almost every day for over a year, in conjunction with some disposable bags as well. They are indestructible and relatively easy to clean. Much cheaper than the store and less wasteful than plastic as well. This is a strong pastry bag for an excellent price. The canvas allows for heavier foods to be piped out without ripping. This pastry bag is easy to use, easy to clean and a good product value. The inner layer seems to start peeling a little soon. Ateco canvas pastry bag is perfect for all our piping needs. Nice large size allows for plenty of filling. Strong and sturdy canvas is sure to last a long time. High quality bag with nice canvas and plastic. These are well built and seem like they will hold up well over time. I can only recommend it. I have only ever used these bags with buttercream frosting, but I love them. They're very sturdy and easy to clean with a little soap. I use a lot of pastry bags, and really love these heavy duty canvas ones by Ateco. They are very durable, hold a lot of icing at this size, and are comfortable to hold for extended periods of time. They wash up well, and overall are a great piping bag. My Mom brought a canvas piping bag to America and have used it for over 20 years that she needed a new one. We looked everywhere and have bought so many others that she was not satisfied with until I found this canvas bag here! This is the perfect size for her to pipe cream puffs! Great pastry bag, hold a large amount of frosting, topping, love the volume it holds when deocrating many desserts. Also easy to clean and store. I like this bag just fine but it is a little difficult to clean. I'm not sure why as i've had similar bags that seemed to wash easier. Other than that, it does the job great. This pipping bag is a great pipping bag I have used it on a number of occasions I have always enjoyed this product I love it. Works good. The only bad thing is that the butter cream frosting weeps through. Bought the plastic lined for the butter creams. Overall a good product. We love these pastry bags!!! Great for our mashed potatoes and homemade whipped cream! Our dishes are looking as beautiful as ever. We even use them for our guacamole and sour cream. I'm definitely not a fan of the canvas decorating bags, they can be durable but they're very difficult to get clean. Frosting will never come completely out and leaves a greasy residue. This product was ok. Personally I don't have time to clean out the pastry bag and let it dry after every use. I would recommend buying the disposable ones because they save you SO much time. I love this canvas bag over the plastic ones. Not only is it reusable and easily washable, it doesn't give the frosting an off taste like some plastic. With Ateco products being top quality, I had not doubts about the quality of this Pastry Bag. Very good quality, but remember, because of the sewed seam, and how thick the material used is, you cannot cut the bag to fit the larger tips, nor can you use a coupler with this bag. If you need to use larger tips, or a coupler, consider the plastic or disposable Pastry Bags. I love these things. You can pipe out stiff dough without worrying about the bag splitting, you don't feel guilty about throwing out a bag after only a single use, they feel better in the hand (in my kinda humble opinion) and I feel like chocolate and frosting don't get as warm as quick. The is a minor battle in the kitchen on what to use but I see the staff more and more leaning towards these. great product and very very fast shipping. We use this for our business daily and will be reordering quite often. Thank you very much for this product. This pastry bag worked great for frosting my cupcakes. The bag was very comfortable to use and great size! Would definitely recommend to other customers. This is the type of bag I always knew, honestly I am really sold on the disposable ones now. However I am glad I have this as if I had a really large project, I would go back to basics. Great bag, well made. I am sure there are many of you out there who will never change, this is the bag if you are looking for top of the line. I have used both the canvas and the plastic Ateco pastry bags and prefer to use the plastic ones. In my opinion, the plastic ones are much easier to clean. I like the reusable quality of this pastry bag, however, I am still partial to the plastic disposable pastry bags. I would recommend this for private cooking jobs. Wonderful for heavy duty piping jobs. We use these canvas bags when piping cookie doughs because so much force needs to be applied. We could never accomplish this in a rubber or plastic bag. This is a great bag -- I love that it's sturdy and reusable. I use it most often for piping frosting onto cupcakes and piping out French macaron batter. This is a great decorating bag. I bought this size as well as 18 inch and they're both fantastic. They also clean up very easily.